Movie Monday time! Stepping back to early 2007, here is a video from Brian Davis titled “LNE: LEGO Packbot.” Nothing can seem to stop this robot; one of my favorite parts is the scene with the robot “swimming” across packing peanuts. You can watch the movie below, and Brian has posted a number of pictures of the robot on Brickshelf. The official MINDSTORMS website has announced the winners of the “NXT NXT” building challenge: a contest involving creations that use two NXTs. Check out the winners and get some inspiration for your next robot! Employing the power of two NXTs is a great way to demonstrate the potential of the NXT set. Starting July 28th, I’ll be teaching a week-long robotics course for teenagers at Stanford University using LEGO MINDSTORMS NXT. The course, Hands-On Robotics for Teens, is one of many technology courses being offered this summer by DMA (Digital Media Academy), a nationally-recognized organization that runs summer computer camps at campuses across the nation. I’ve written a course description and put together a five-day course outline, and DMA has posted the information to their website. The entire course will be NXT-based. We’ll be using the educational version of the NXT set and also the Education Resource Set. And what’s the highlight of the course? I think it will be the robotic sumo competition! The course is for teenagers (ages 13-19), and if you’re interested in signing up for the course (or have a teen who may be interested), you can find out more about registration at the DMA website. I’m definitely excited. After all, what’s a summer without a robotic sumo competition? Previously, there was a “secret” NXT movie that could be accessed on the home page of the MINDSTORMS website by clicking an exclamation mark in a sentence. The hyper-linked exclamation mark seems to be gone now, and while the URL is still valid, the same movie and a few others featuring Alpha-Rex have appeared on the “movies” section of the MINDSTORMS website. Check these little movies out if you want to see an Alpha-Rex play ball, dance, and fight a fly (and win!). More book news! I just reviewed Daniele Benedettellis book Creating Cool MINDSTORMS NXT Robots and posted the review on Amazon.com. In summary, though, great job, Daniele! Below are two pictures I took of robot’s from the book: NXT AT-ST and Omni-Biped. Featuring updated instructions for the improved leJOS NXJ software, this accessible manual is the perfect guide to LEGO Mindstorms NXT, an incredible new kit for building and programming your own robots. Using Java, the most popular and easy-to-use programming language available, this manual helps engineers and amateurs alike design and build their own customized robots, programmed however they desire. Complete with a diverse set of projects, building tips, programming codes, complete 3D-rendered building instructions, and hundreds of illustrations, this useful handbook is the perfect complement to the LEGO NXT kit. The NXT intelligent brick’s Bluetooth capabilities are introduced as well as the newest available parts, including the gyro and the RFID sensor. I’m looking forward to the second edition, Brian! There are numerous books that cover the NXT set, but many of them have different focuses: building, programming, custom sensors, etc. So if you’re looking for some NXT books that would interest you, how do you know which ones to get or even what is available? 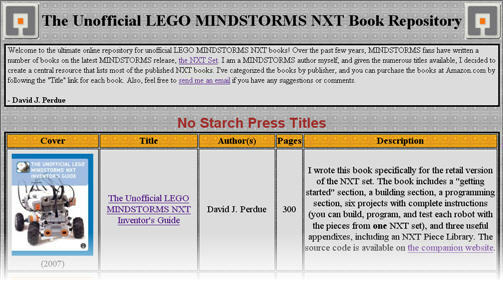 To address this problem, I’ve put together an Unofficial LEGO MINDSTORMS NXT Book Repository that lists most of the published NXT books that I’m aware of. The repository—at www.booksnbots.com—includes a brief description of each book along with other basic information and links to Amazon.com. Leave a comment here or email me if you have any suggestions for improvement on the repository or other comments. I’d love to hear what you think! If you’re a Java fan, you will be excited to hear that version 0.6 of leJOS NXJ was recently released. This release finally brings full Max OS X support as well as a number of other fixes and new features. You can download it here. Looking for a contest that demands more complexity? 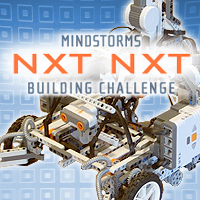 Then the official MINDSTORMS NXT NXT Building Challenge is for you. In this contest, inventors are required to create an NXT robot that uses two NXTs that communicate with each other. That’s why this is called the “NXT NXT” building challenge. You have until Monday, June 30 2008, to submit your creation to NXTLOG, where you will find the complete rules. The recent 2008 FIRST LEGO League World Festival has brought a flurry of postings and pictures on the news section of the MINDSTORMS website. How many teams participated, you say? 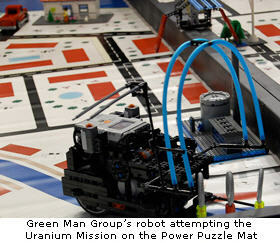 The April 21 post mentions, “Eighty one teams from around the world participated in the 10th FIRST LEGO League (FLL) World Festival this past weekend at the Georgia Dome in Atlanta.” Below is just one of the pictures, which shows a winning robot that landed the “Green Man Group” first place in the Robot Performance Award.